2003-07-30 Application filed by Bennett Steven L., Kevin Connolly, Elliott Gruskin, Ying Jiang filed Critical Bennett Steven L.
Star polymers of soft segment forming monomers are useful in forming surgical devices. The star polymers can be endcapped with isocyanate, mixed with a filler and/or cross-linked. The polymer compositions are useful, for example, as fiber coatings, surgical adhesives or bone putty, or tissue growth substrate. This application is a continuation-in-part of copending application Ser. No. 08/477,098 filed Jun. 7, 1995, which is a continuation-in-part of copending application Ser. No. 08/278,898 filed Jul. 22, 1994. The entire disclosure of these two applications are incorporated herein by reference. Polymers and copolymers of, and surgical devices made from, lactide and/or glycolide and/or related compounds are well-known. See, e.g., U.S. Pat. Nos. 2,668,162, 2,683,136, 2,703,316, 2,758,987, 3,225,766, 3,268,486, 3,268,487, 3,297,033, 3,422,181, 3,442,871, 3,463,158, 3,468,853, 3,531,561, 3,565,869, 3,597,449, 3,620,218, 3,626,948, 3,636,956, 3,736,646, 3,739,773, 3,772,420, 3,773,919, 3,781,349, 3,784,585, 3,792,010, 3,797,499, 3,839,297, 3,846,382, 3,867,190, 3,875,937, 3,878,284, 3,896,802, 3,902,497, 3,937,223, 3,982,543, 4,033,938, 4,045,418, 4,057,537, 4,060,089, 4,137,921, 4,157,437, 4,243,775, 4,246,904, 4,273,920, 4,275,813, 4,279,249, 4,300,565, and 4,744,365, U.K. Pat. or Appln. Nos. 779,291, 1,332,505, 1,414,600, and 2,102,827, D. K. Gilding et al., “Biodegradable polymers for use in surgery-polyglycolic/poly (lactic acid) homo- and copolymers: 1,” Polymer, Volume 20, pages 1459-1464 (1979), and D.F. Williams (ed. ),  Biocompatibility of Clinical Implant Materials, Volume II, chapter 9: “Biodegradable Polymers” (1981). All of the foregoing documents are hereby incorporated by reference. The purified monomer(s) used to form the Z groups are preferably dried and then polymerized at temperatures ranging from about 20° C. to about 130° C., preferably above 75° C., in the presence of an organometallic catalyst such as stannous octoate, stannous chloride, diethyl zinc or zirconium acetylacetonate. The polymerization time may range from 1 to 100 hours or longer depending on the other polymerization parameters but generally polymerization times of about 12 to about 48 hours are employed. In addition, a polyhydric alcohol initiator is employed to provide a highly branched or star structure. 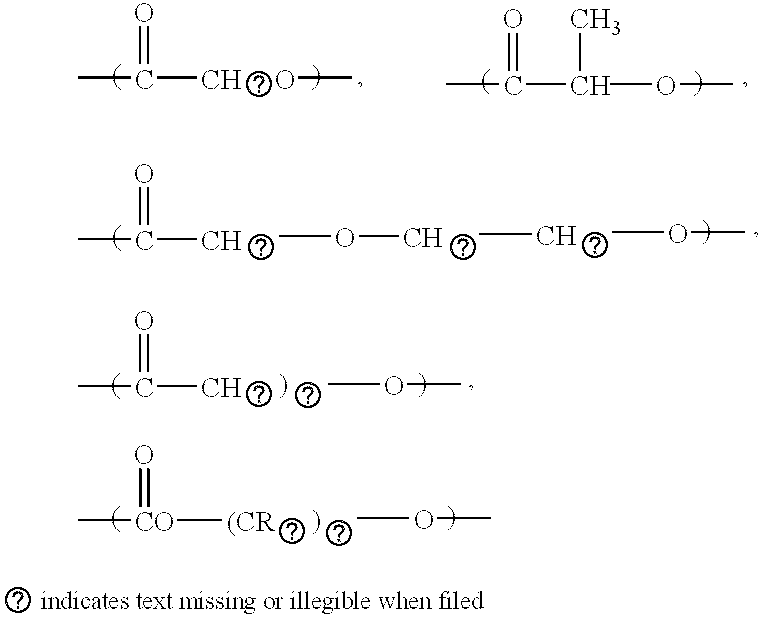 Any polyhydric alcohol may be employed, with mannitol (C 6H8(OH)6), pentaerythritol (C(CH2OH)4) threitol (C4H6(OH)4) being preferred. Generally, the amount of initiator used will range from about 0.01 to about 30 percent by weight based on the weight of the monomer. The amount of initiator employed will depend on the final properties desired in the polymer and the ultimate end use of the polymer. Thus, when preparing polymers for use as a coating, the initiator will be present in the reaction mixture in an amount from about 0.5 to about 5.0 weight percent based on the weight of the monomer. When preparing polymers for use as a bone substitute, the initiator will be present in an amount from about 15 to about 25 weight percent based on the weight of the monomer. 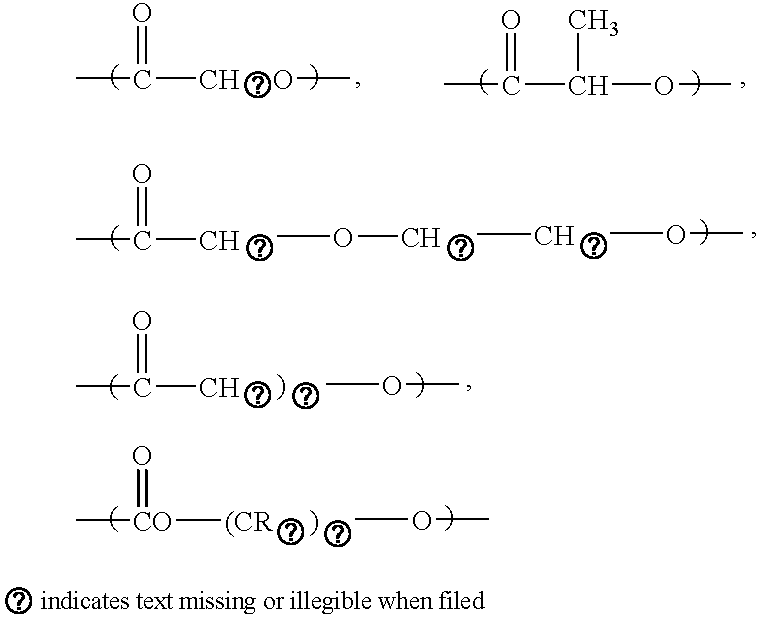 The following non-limiting Examples illustrate the preparation of polymers in accordance with the present disclosure. A star copolymer of p-dioxanone and glycolide is prepared as follows: 458.3 grams of previously dried p-dioxanone, 41.7 grams of previously dried glycolide, 147.5 grams of mannitol, and 0.106 grams of stannous octoate catalyst are reacted in a N 2 atmosphere under anhydrous conditions in a one liter 3 neck flask equipped with a mechanical stirrer. A star copolymer of p-dioxanone and glycolide is prepared as follows: 458.3 grams of previously dried p-dioxanone, 41.7 grams of previously dried glycolide, 83.5 grams of pentaerythritol, and 0.106 grams of stannous octoate catalyst are reacted in a N 2 atmosphere under anhydrous conditions in a one liter 3 neck flask equipped with a mechanical stirrer. Polymerization is conducted at 90° C. with stirring for a total reaction time of about 69 hours. The copolymer is then extruded and heated at 75° C. for 48 hours to remove vaporizable impurities. Ten grams of the isocyanate endcapped polymer of Example 9 is mixed with 5 grams of hydroxyapatite. Once a substantially homogenous mixture is attained, the polymer is cross-linked by the addition of 0.5 ml of water, 1 ml of DEAE and 0.5 ml stannous octoate. As the reaction proceeds, CO 2 is released, forming a moldable foam which has a puttylike consistency and can be molded by hand into a desired shape or easily packed into a bone defect. 1.0 gram of the endcapped star copolymer/calcium phosphate tribasic/hydroxyapatite composition is placed into a scintillation vial. Two drops of a 2:1 diethylethanolamine/H 2O mixture and 2 drops of Sn(Oct)2 catalyst solution are added to the vial. The resulting composition is placed into a tibia-bone defect, where it foams with the release of CO2, absorbs blood and hardens to provide structural support to the bone. 20.6 g of diisocyanatolysine ethyl ester was placed in a clean, dry 100 mL round bottomed flask equipped with stirrer and N 2 flow. The material was allowed to dry. A 95:5 weight percent polyethyleneoxide-glycolide copolymer (1000 molecular weight) was placed under vacuum for about 1 hour. The polymer was then added dropwise to the diisocyanatolysine ether ester via syringe to provide an isocyanate-endcapped material. A bone substitute material is prepared by mixing 0.55 grams of the encapped star copolymer obtained in EXAMPLE 9 with 1.65 grams of fine grained b-TCP. Both the copolymer and TCP were previously dried at 145° C. for 2 hours under vacuum prior to mixing. Then, 38.5 ml of DEAE is added to the mixture. The resulting material is packaged in a substantially dry state within a foil or other water-impermeable package. In this state, the product is stable for several months. When needed, the package is opened and the product is packed into bone. Upon contact with water naturally present or added, CO 2 gas is generated so that when the material hardens a rigid, porous material is then provided, giving structural support to aid in hard tissue healing. Over time, the biodegradable polymer is replaced with new bone tissue growing into the porous bone substitute. The material of EXAMPLE 27 is further mixed with excess lysine-diisocyanate (110 ml) which increases the amount of CO 2 generated upon implantation thus increasing the number of pores in the resulting bone substitue. In this manner, the porosity of the bone substitute can be adjusted as desired. b) a bone-growth inducing substance on a surface of the implant, the bone-growth inducing substance comprising a copolymer containing a major amount of alkylene oxide units and a minor amount of units derived from a bioabsorbable monomer selected from the group consisting of glycolic acid, glycolide, lactic acid, lactide, p-dioxanone, trimethylene carbonate, trimethylene dimethylene carbonate, dioxepanone, alkylene oxalates, epsilon-caprolactone, and combinations thereof, said copolymer being endcapped with at least one lysine isocyanate group. 2. A bone fusion device as in claim 1 wherein the implant is selected from the group consisting of fusion cages, plugs, and hip joint prostheses. 3. A bone fusion device as in claim 1 wherein the isocyanate group is derived from diisocyanatolysine ethyl ester. b) a bone-growth inducing substance on a surface of the implant, the bone-growth inducing substance comprising a composition containing a plurality of lysine-based isocyanate endcapped absorbable star polymer molecules, said absorbable star polymer molecules including repeating units derived from one or more monomers selected from the group consisting of p-dioxanone, alkylene carbonates and mixtures thereof and said plurality of star polymer molecules having at least one terminal, reactive isocyanate group and being capable of undergoing cross-linking with each other when exposed to water thereby curing to provide a solid material. 5. A bone fusion device as in claim 4 wherein the implant is selected from the group consisting of fusion cages, plugs, and hip joint prosthesis. 6. A bone fusion device as in claim 4 wherein the absorbable star polymer molecules include repeating units derived from dioxanone. 7. A bone fusion device as in claim 6 wherein the absorbable star polymer molecules further include repeating units derived from e-caprolactone. 8. A bone fusion device as in claim 4 wherein the absorbable star polymer molecules further include repeating units derived from alkylene carbonates. 9. A bone fusion device as in claim 4 wherein the bone-growth inducing substance further comprises a filler. 10. A bone fusion device as in claim 9 wherein the filler is a bioceramic. at least one of said (Z)m groups being endcapped with a lysine based isocyanate and containing a terminal, active isocyanate group, and wherein said plurality of star polymer molecules are capable of undergoing cross-linking with each other when exposed to water thereby curing to provide a solid material. 12. A bone fusion device as in claim 11 wherein the implant is selected from the group consisting of fusion cages, plugs, and hip joint prosthesis. 13. A bone fusion device as in claim 11 wherein the bone-growth inducing substance further comprises a filler. 14. A bone fusion device as in claim 13 wherein the filler is a bioceramic. b) a coating comprising a copolymer containing a major amount of alkylene oxide units and a minor amount of units derived from a bioabsorbable monomer selected from the group consisting of glycolic acid, glycolide, lactic acid, lactide, p-dioxanone, trimethylene carbonate, trimethylene dimethylene carbonate, dioxepanone, alkylene oxalates, epsilon-caprolactone, and combinations thereof, said copolymer being endcapped with at least one lysine isocyanate group. 16. A coated surgical device as in claim 15 wherein the surgical article is selected from the group consisting of clips, fasteners, staples, sutures, fibers, pins, screws, prosthetic devices, wound dressings, drug delivery devices, anastomosis rings and implants. b) a coating comprising a composition containing a plurality of lysine-based isocyanate endcapped absorbable star polymer molecules, said absorbable star polymer molecules including repeating units derived from one or more monomers selected from the group consisting of p-dioxanone, alkylene carbonates and mixtures thereof and said plurality of star polymer molecules having at least one terminal, reactive isocyanate group and being capable of undergoing cross-linking with each other when exposed to water thereby curing to provide a solid material. 18. A coated surgical device as in claim 17 wherein the surgical article is selected from the group consisting of clips, fasteners, staples, sutures, fibers, pins, screws, prosthetic devices, wound dressings, drug delivery devices, anastomosis rings and implants. 20. A coated surgical device as in claim 19 wherein the surgical article is selected from the group consisting of clips, fasteners, staples, sutures, fibers, pins, screws, prosthetic devices, wound dressings, drug delivery devices, anastomosis rings and implants. 21. 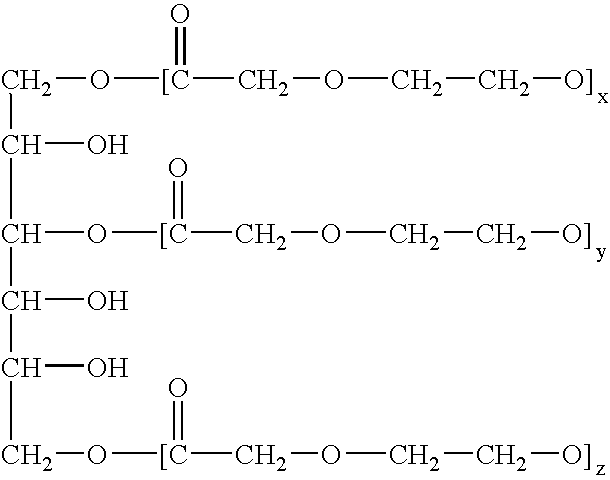 A biocompatible composition comprising a branched copolymer containing a major amount of alkylene oxide units and a minor amount of units derived from a bioabsorbable monomer selected from the group consisting of glycolic acid, glycolide, lactic acid, lactide, p-dioxanone, trimethylene carbonate, trimethylene dimethylene carbonate, dioxepanone, alkylene oxalates, epsilon-caprolactone, and combinations thereof, said copolymer being endcapped with at least one group derived from a diketene acetal. 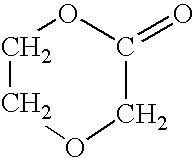 NL8703115A (en) * 1987-12-23 1989-07-17 Groningen Science Park Biodegradable polyurethanes, based thereon produce and polyester prepolymers.